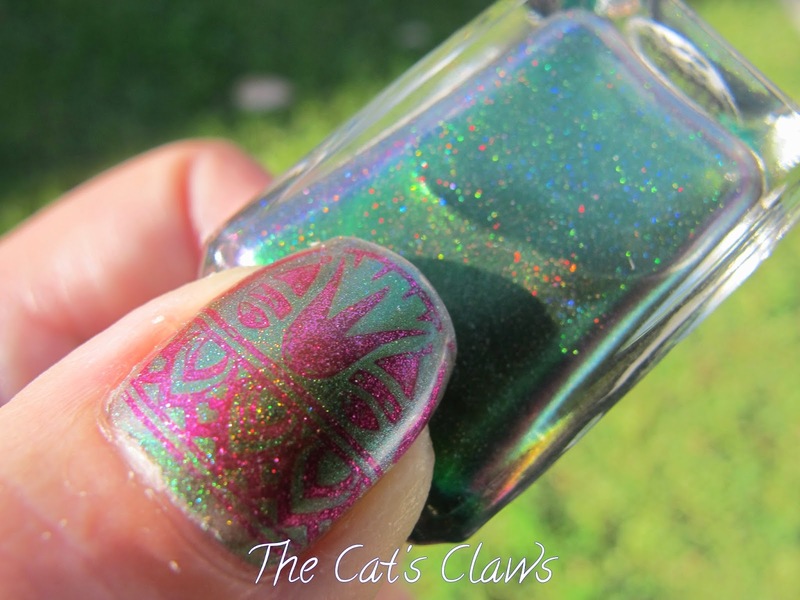 I have to say that as my focus has now shifted to stamping, I choose what I am going to stamp first and then run around like a blue arse fly looking for just the right polish! 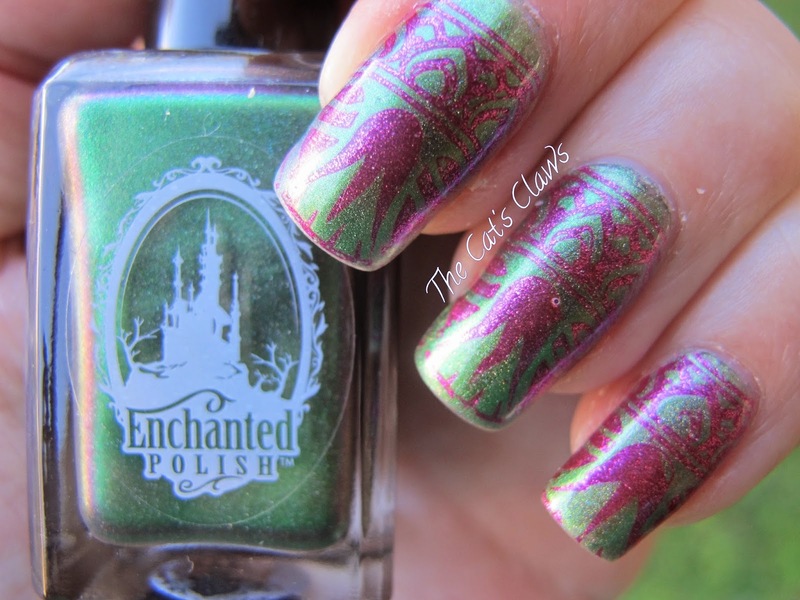 So having decided on MoYou London Explorer Collection 04 which is Egyptian themed, I decided Enchanted Polish Hey Jude was good enough. 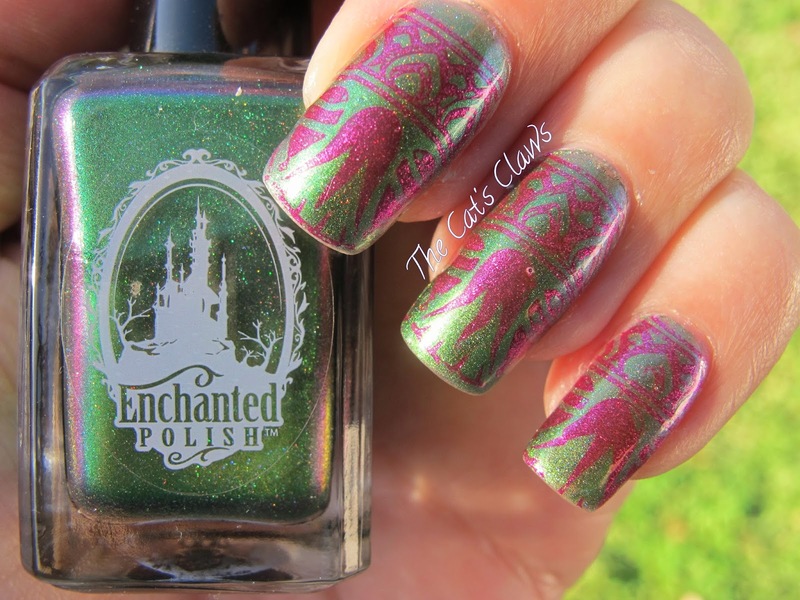 Hey Jude is a bright green to greyed out purple duochrome holographic beauty in a bottle! In the sunlit pictures you can see some of the gorgeous purple colour on the edge of the bottle. I decided on Kleancolor Metallic Pink to stamp the design with, whilst these colours don't seem to be very Egyptian per se, but they work very well together. The Metallic Pink is a much deeper colour in real life, in these photos the sun has washed out the colours somewhat. Plus that air bubble on my ring finger is not even noticeable! 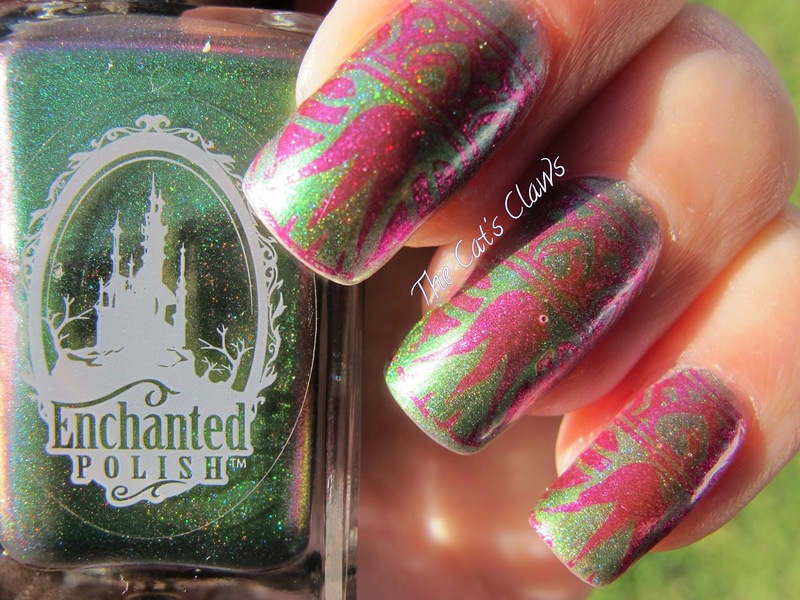 A bonus shot because that holographic goodness is too pretty to be missed! So St George's Day has rolled around again, and I was going to do something a bit more subtle i.e. not immediately recognisable as a St George's Day mani. I chose the writing from MoYou London Pro Collection XL07 to represent Shakespeare who was actually born on St George's Day. 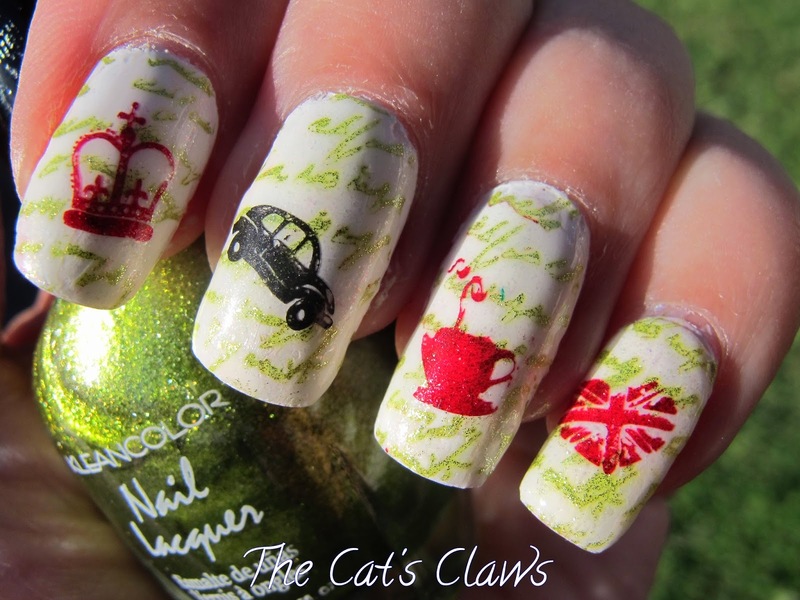 The reason I used Kleancolor Metallic Green for the writing was because I was actually going to stamp red roses (the national flower for England) over the top. 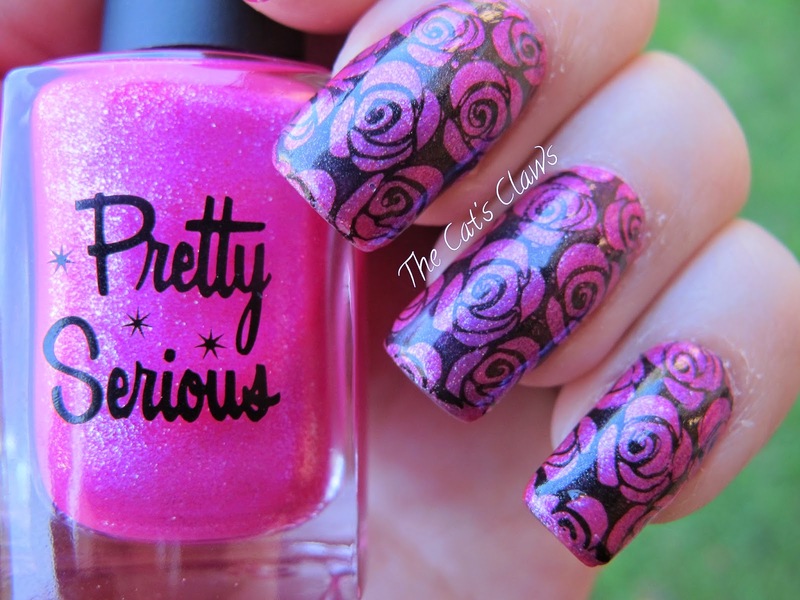 That idea was scrubbed when I couldn't find single rose stamps. I instead however, choose to do some iconic images from MoYou London Tourist Collection 01 in Kleancolor Metallic Red and Metallic Black. 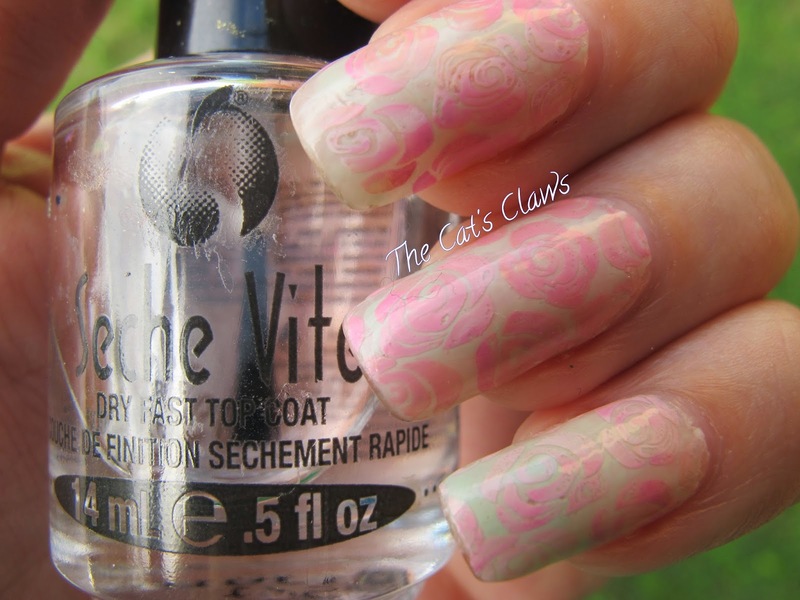 This was all stamped over two coats of Sally Hansen White on with one coat of Picture Polish White Wedding. In Lieu of Easter, I Give You Peacocks! 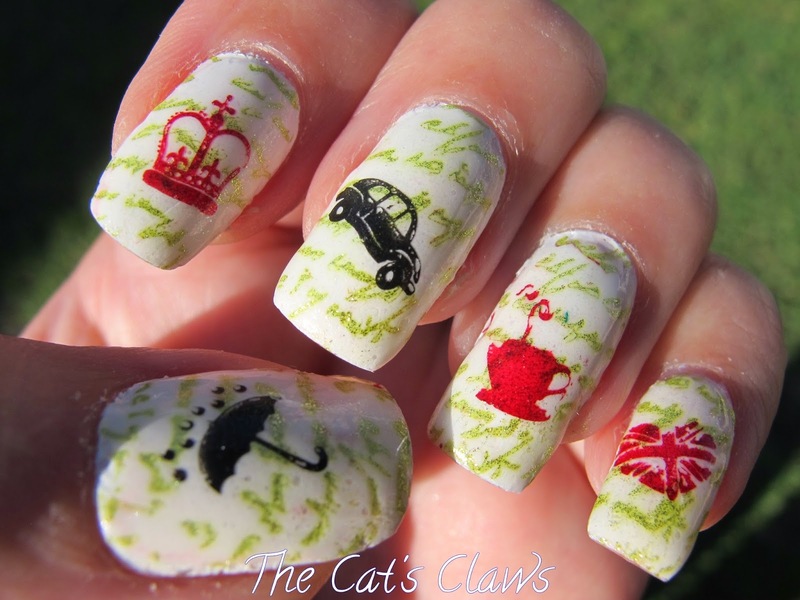 Easter Time, and do you think I could find my water decals or even inspiration for some nail art? Yep you guessed it a big fat NO! So in casting around I thought I would use Crows Toes Green Thumb Of Doom as a base and go from there. Looking at my MoYou London Mother Nature plate I wondered if I could create something Eastery from that. 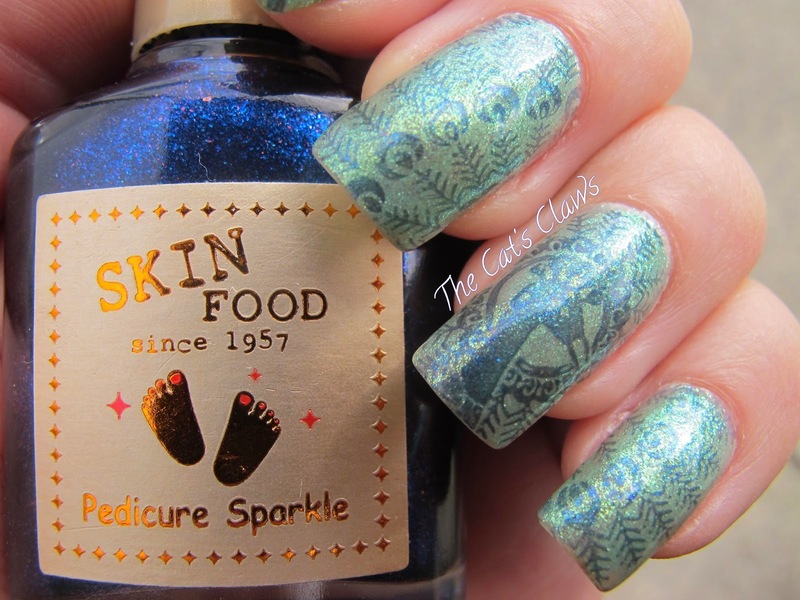 This mani was much more shimmery in real life, but unfortunately the stamping looks washed out in the photos that I took in the sun, so I have only used the shade ones here. I wish you all a Happy Easter and may the Easter Bunny visit you too. 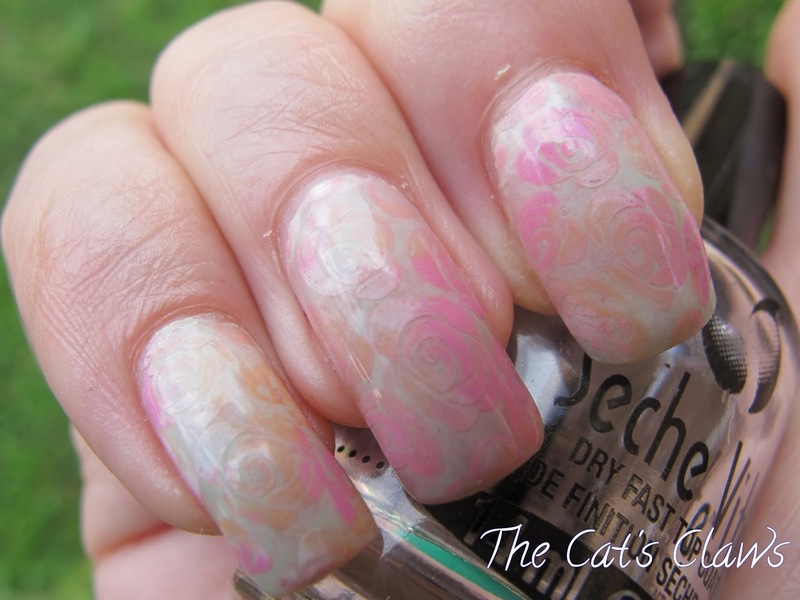 Continuing with my new love of stamping, and the success of my pink roses last week, I decided upon stamping my favourite flower from my garden back in the UK. Namely those beautiful creamy peachy pink roses that smelt so divine. This was so pretty and delicate looking in real life but I don't think it has translated too well into these photos. 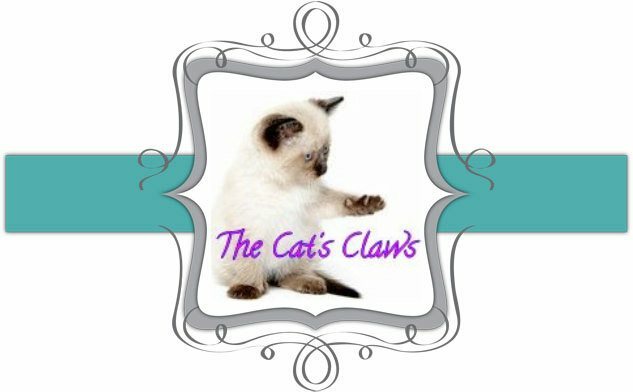 Anyway on to my mani, and I'm afraid it was a long drawn out process as you will discover! First off I decided on a translucent white background speckled with green. Did I achieve that? No. I used four coats of OPI Don't Touch My Tutu which is very sheer hence the four coats. I then used saran wrap to dab on Ulta3 Corsican Rose, unfortunately I didn't really wait for it to dry and put a coat of Seche Vite on which smeared the Ulta3 Corsican Rose and blended it beautifully with the OPI Don't Touch My Tutu! Deciding to carry on rather than start again I used MoYou London Pro Collection XL 07 and two Chi Chi polishes from the Pastel Collection (the pink from my left hand and the orange from my right hand) and Sally Hansen White On. 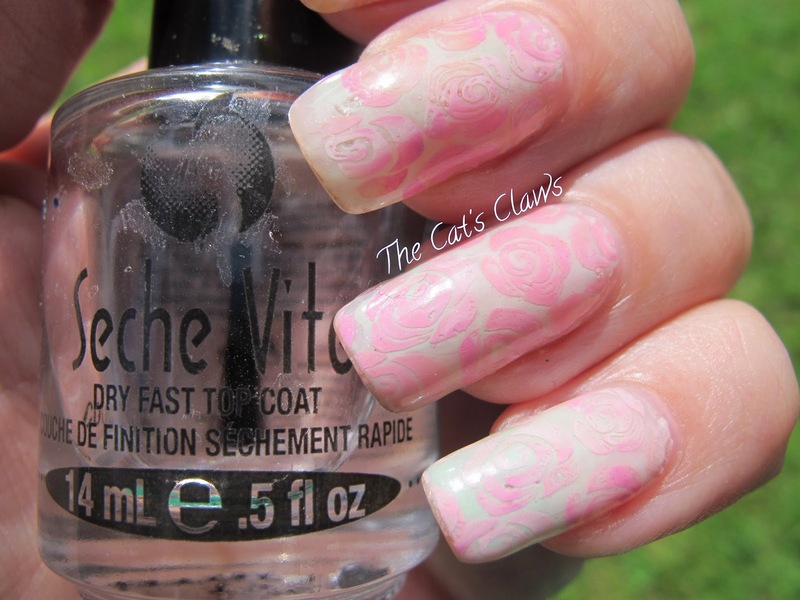 Finished off with a top coat of Seche Vite when it was all dry. And isn't it always the way, I thought the roses on my left hand were far more like what I had envisaged! Yes, I have a confession to make! I am officially addicted to stamping! 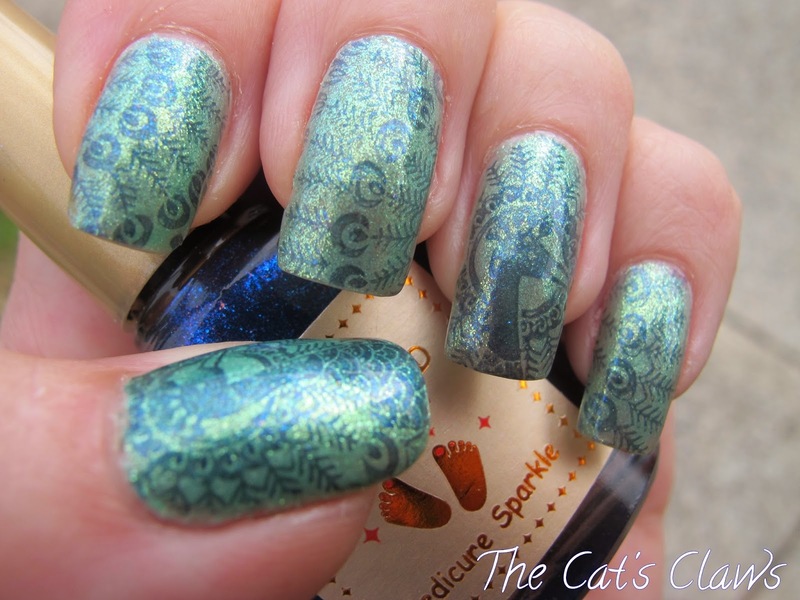 So I'm afraid this blog is going to feature a lot more stamping, is that a bad thing? Only time will tell. Having discovered MoYou Plates and squishy stampers along with using my Kleancolor metallic polishes there is now no stopping me. Gratuitous shot, I just love the cool tones in this photo! 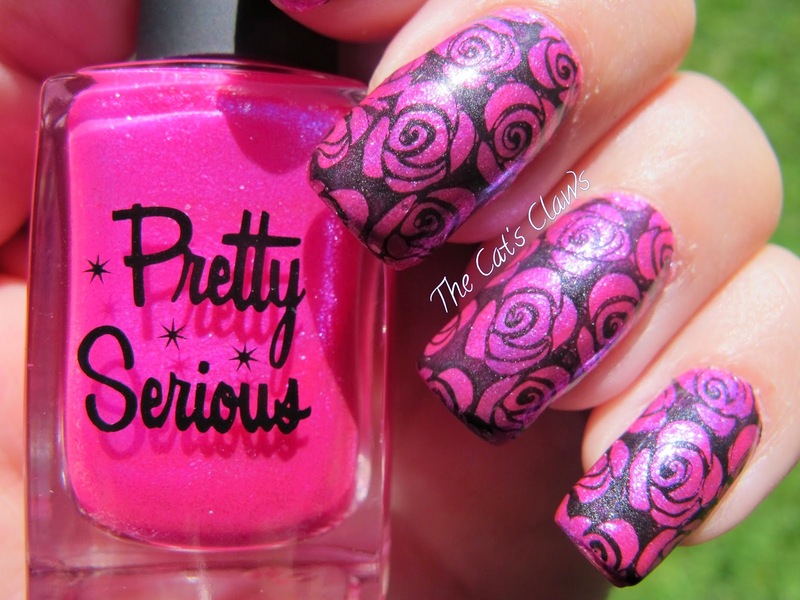 On to my mani then, three coats of Pretty Serious The Pink One, (I wanted to do pink roses) using MoYou London Pro Collection XL 07 stamped with a of Covergirl Black Diamond a one coat black mixed with a small amount of Kleancolor Metallic Black as I was afraid the Covergirl might not stamp by itself.